RENTON, WA - MetroAir has entered partnership with PMDG to give MetroAir Virtual pilots the first opportunity to fly the 737 MAX 8 in FSX and P3D. Robert Randazzo has informed MetroAir staff the MAX 8 will be ready for beta testing in early June. The beta model will be available to MetroAir pilots with a rank of First Officer or higher, and will require 2,500 MetroMiles to download. "We are extremely pleased to announce this partnership with PMDG," said Chief Media Officer Anders Young, "The staff here at MetroAir know how much our pilots want to fly PMDG products." Fighting Norwegian Air Shuttle on the East Coast and the newly strengthened Alaska/Virgin America on the West Coast, MetroAir has decided to become the next operator of Boeing's newest product, the 737 Max 8. In the simulator world, MetroAir will be leasing the 737 Max 8 from BOC Aviation, who recently agreed to purchase 13 airframes at a total value of over $1.4 billion. "The current market demands the newest and most efficient aircraft to run a successful airline," explained Chief Operating Officer William Hogarth, "The Max 8 will allow us to operate specific routes that keep MetroAir competitive." It is widely assumed the 737 Max 8 will largely be focused at MetroAir's Boston hub. 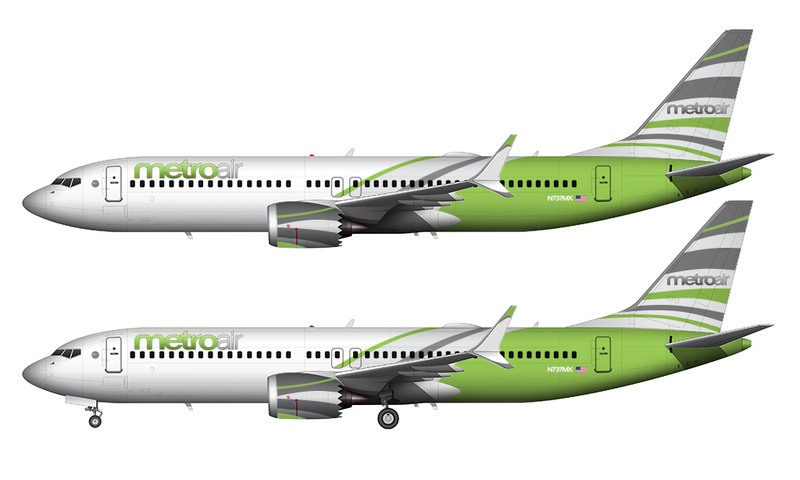 The range of the Max 8 would potentially enable MetroAir to expand their narrowbody Transatlantic operations. MetroAir currently flies the Airbus A319ceo to select cities across the Atlantic Ocean, but occasionally has to take weight restrictions for operational reasons.